If it would be Halloween all year long Grave Robber would be your perfect band, but without this popular feast they’re just mediocre wannabees. This band was formed in 2005 and they now present us their album Be Afraid. Their sound is a mixture of the music of Volbeat, Type O Negative and Wednesday 13/Murderdolls. If you think of Volbeat’s ‘Maybellene I Hofteholder’ with the lyrics of a random Wednesday 13 song, while the band performs this song in the costumes of GWAR you’ll have a reasonable idea of what Grave Robber is all about. Their music is not that bad at all, but they’re just simply too late. Everything has been done before and Be Afraid doesn’t add anything to it. 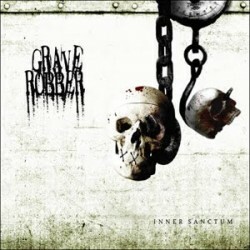 If your local youth centre is seeking a nice act for a Halloween party, you should recommend Grave Robber. For any other occasion you should look a bit further.